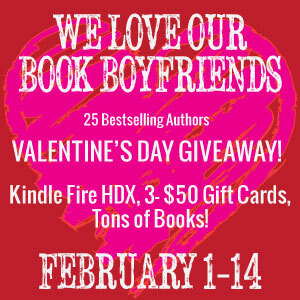 **Final Two Days** We Love Our Book Boyfriends Giveaway!! 25 Bestselling Authors – One Mega Giveaway! This entry was posted in Announcement, Specials & Giveaways. Bookmark the permalink. 2 Responses to **Final Two Days** We Love Our Book Boyfriends Giveaway!! Thanks for the giveaway. Happy Valentine’s Day.